Bill Findler, class of 1970, died on June 18th. Bill was a lawyer and the track and cross country coach at Washington and Lee High School in Arlington, VA. Go here to see a few more details and to see or add to an online rememberance page. Cards can be sent to Bill's wife Alice at 3165 Key Blvd; Arlington, VA 22201. 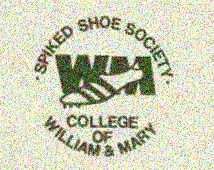 Anyone wishing to make a donation to the "Bill Findler Memorial Scholarship " can send a check to W&M AEF; PO Box 399; Williamsburg, VA 23187. Ed Moran and Sean Graham finished 5th and 8th in the 5K at the national championships. The top three in the race make the world championship team. Two weeks ago Graham ran 8:27 for two miles while Moran has not raced for two months. Click here to see video of the race which starts at the half way point of this link. Coach Newberry was 17th in the 10K. Click here to see the entire race. 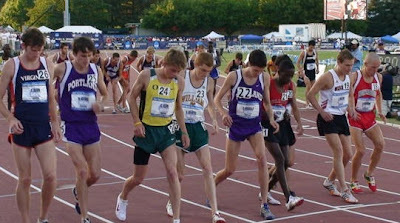 Sean Graham '01 finished 11th in the 2 mile race at the Prefontaine Classic. The race was won in 8:03 and a new American record of 8:07 was set by the 3rd place finisher. Click here to see the race. Keith Bechtol finished 14th in the NCAA 10K. while Bonnie Meekins finished 18th in the heptathlon. The narrowest of margins, one single second in a half-hour race, was all that prevented senior Keith Bechtol (Alexandria, Va.) from earning his first All-America honor last night at the NCAA Track Championships. The 10,000m race was a slow, strategic race won by Shadrack Songok of Texas A&M-Corpus Christi in 28:55.83. Bechtol finished 14th in 29:20.05, less than a second behind the 13th-place finisher who was the last to earn All-American honors. Click the arrow to see the beginning of the NCAA 10K and here to see Keith at the 9K and see how close he was to the leaders (as he explained in his post) late in the race. William and Mary senior Bonnie Meekins (Herndon, Va.) capped her five years in Williamsburg by finishing 16th in the heptathlon at the NCAA Championships. She moved up from 18th after the first day with a near-career-best performance in the javelin throw and a new personal best in the 800m run to total 5,444 points. Meekins got a boost in the standings before she even went to sleep last night, as prohibitive favorite Diana Pickler of Washington State was disqualified from the 200m dash after stepping on the lane line too many times, dropping her from first to 25th. Opening the day with the long jump, Meekins jumped 18’ 9”, good enough to keep pace in the field at 18th overall. She began her move upwards in the javelin throw, where her fifth-place throw of 134’ 1” was only one centimeter shy of her personal-best in the event (which converts to 134’ 1” as well). In the 800m run, she punched the accelerator with a personal-best performance of 2:18.59, placing sixth in the event and moving up two spots in the final standings to finish 16th. Watch Bonnie running the hurdles at the NCAA meet. You can also see Bonnie high jumping by clicking here and here. Keith Bechtol was kind enough to share his thoughts on his NCAA 10K effort. Bonnie, Coach Gibby, Coach Stimson, and I arrived in Sacramento Monday night and spent most of Tuesday and Wednesday relaxing and making final preparations before the big competition. My final workout on Monday went well. I was able to finish up with a fast 1000 at the end which is big confidence booster for me. I'm not known for my leg speed. After the workout, I felt a shade tight high up on my left hamstring. That made me a bit nervous going into this week but I took a light day on Tuesday and Coach Gibby helped stretched out my hamstring. By Thursday everything seemed back in order... click here to see the rest.